A wayside fuel seller popularly known as ‘Gao Gao’, Anthony Drobo, 42, was in the early Wednesday morning shot dead by three suspected armed robbers in his room at Kotwi-Nkoransa, close to where he operated his fuel station. Drobo was shot in the thigh, slashed with his own cutlass on the head and shoulder and beaten with sticks by the robbers till he be became unconscious and later died. The robbers took away an unspecified amount of money tied in a polythene bag and six mobile phones belonging to the wife, the deceased and other relatives leaving with them. The robbers were said to have broken into the room in the wooden structure which had no lock and shot the deceased after asking him for the money. This is about the fourth armed robbery incident in which the victims have been killed within a spate of about two months. The first was the killing of a police officer at Denchemuoso, followed by the killing of an electrician at Santasi and later a staff at the Regional office of the Ministry of Food and Agriculture at Aputuogya. In all the instances, the victims offered no resistance and were shot by the robbers without any provocation. The wife of the deceased, Hannah Amponsah told the media that somewhere around 2:30 am, while they were asleep; they heard a bang on the door. She said the husband who suspected that they could be armed robbers, asked her and one of their sons who was sleeping with them to lift the mattress and to hide behind it. 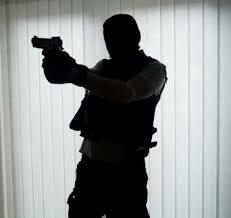 She said just then, the three armed robbers who were unmasked, armed with a locally manufactured pistol entered the room and asked the husband to bring out the money. She said even before the husband could reply, the robbers shot him in the thigh and used a cutlass that was lying in the room to slash him and started beating him with the stick. She said the robbers beat up her husband until he became weak and unconscious before they left him. The Asokwa Divisional Police Commander, Assistant Commissioner of Police (ACP) Mr Charles Domanban, who confirmed the incident to the Graphic Online, said the police had the information about the robbery somewhere around 2:45 and quickly dispatched a team to the scene. According to him, a patrol team that had been stationed in the area left the junction where the incident took place less than an hour when the robbers struck. He said although the police got there on time, the robbers managed to escape and believed the surrounding bushes aided them to easily escape. He strongly believed that the robbers had information from someone in and around the area. According to Mr Domanban, the lack of security at the place also made easier for the robbers to strike and was of the view that if at least the room where the deceased slept had a lock and the main door to the structure also had a door, it could have least given him enough time to call the police before the robbers got to him room. He thus appealed to the public to take their security serious and ensure that their rooms and were properly secured and not easy targets for armed robbers. According to him, the police have picked up some leads and were following up on them.